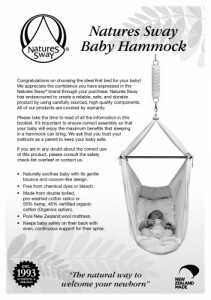 We’ve just loaded some updated Baby Hammock instructions on our site. It’s been quite a few years since we refreshed them so thoroughly but a few little issues have transpired over the years. In business, just as in life, we are learning as we go along. So, first up we’ve addressed the mattress washing. It seems that our natural wool mattress is literally never the same again if you wash it by fully immersing it in water. Some performed better than others, which we guess was due to the variation on the wool batches, how soiled they were and how vigorously they were washed. If the mattress is kept from being soiled they don’t really need to be washed so we have erred on the side of caution and now advise to surface wash only. 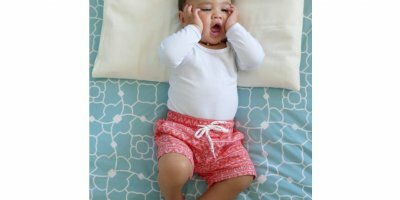 The great news is that we now have the best kind of mattress protector as an accessory…a half size version of the famous NZ wool Dri cot, which saw both my kids through the baby hammock and bed stage well beyond bed-wetting. Next we needed to clarify a couple of bottom lines with the hammock, such as the fact that it’s for back-sleeping only. 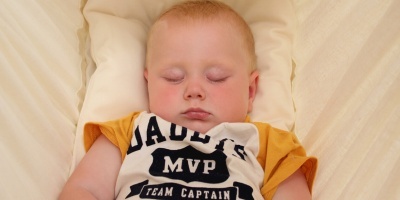 As we all know back sleeping is recommended by most leading experts, yet we know that not all babies settle best on their back. 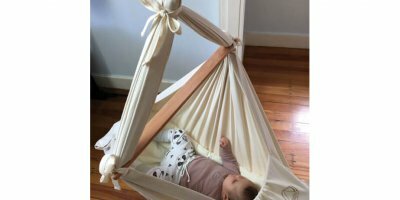 We hope that the baby hammock will help your infant to do just that, but if not, we need to specify that this is the only safe way to use a hammock, hence it is now top of the list for safety! We’ve also added the instruction to not bounce the hammock so hard as to cause the parts to “jump”. In the past we just encouraged people to check all clips and attachments are closed and secure, which should ensure that no parts will ever get disconnected during use. It just seemed like common sense to us to not bounce the baby so vigorously that the bits clatter and clank or the baby bounces off the mattress, but it seems best that we are clear about this (note the new thicker spring sold since end of 2014 has very little ‘snap-back’ so an easy bounce is what it is designed for). 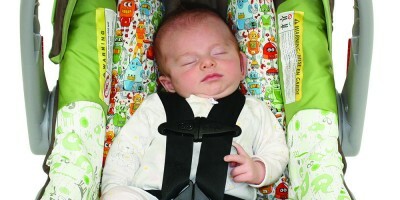 We hope you will read all parts of the baby hammock instructions and especially the safety check list. This is now in three parts: Safe Use, Safety Check and Safe Environment. There are some absolute dos and don’ts in there and some helpful tips too, for instance, we made a few tweaks to pages 5, 6 or 7 (yes they’re numbered now), regarding the actual placement of baby in the hammock. If your new born suffers from reflux, we recommend propping them up by placing a small folded towel under the chest area. You can also put a small weight at the foot end which will tip the balance of the hammock so the head is raised. We also have some important recommendations with regards to using the mattress stiffener, which should only be used once baby is over 4 kg. You can also read more about when to use the mattress stiffener here. The only noticeable change to the front of the instructions is that we’ve replaced the oval ‘Made With Love Since 1993’ with a big star saying “Established in 1993 – Authentic and Original”. Of course we still put love into everything we make, and proudly continue to stand fast and do all our manufacturing in New Zealand, to the point where we now consider ourselves to be a heritage brand! On the back page you will see that the warranty was doubled to 2 years, in line with standard commercial practice. We needed to clarify this as our wonderful Danish distributors at Sneglehuset have expanded their territory from Scandinavia to all of the countries in the European Union, as well as Iceland and Norway. Congratulations to them for all their hard work and the confidence they have expressed in our beautiful, home-grown brand. 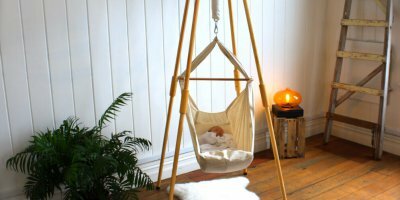 There are many lovely images showing our baby hammock being used in Danish homes on Instagram. You can view them by using #naturessway.